For HDPI, XHDPI, etc. what should be the ideal size of the launcher icon? Should I have to create 9-Patch images for the icon to scale automatically, or would it be better to create separate icons? Basically, all of the other icons should be in proportion to the 'baseline' icon, MDPI at 48 x 48. Don't Create 9-patch images for launcher icons . You have to make separate image for each one. XXXHDPI - 192 x 192. Note: WEB(512 x 512) image is used when you upload your android application on Market. The xxxhdpi size needed only by the launcher icon as the Supporting multiple Screens official site says. 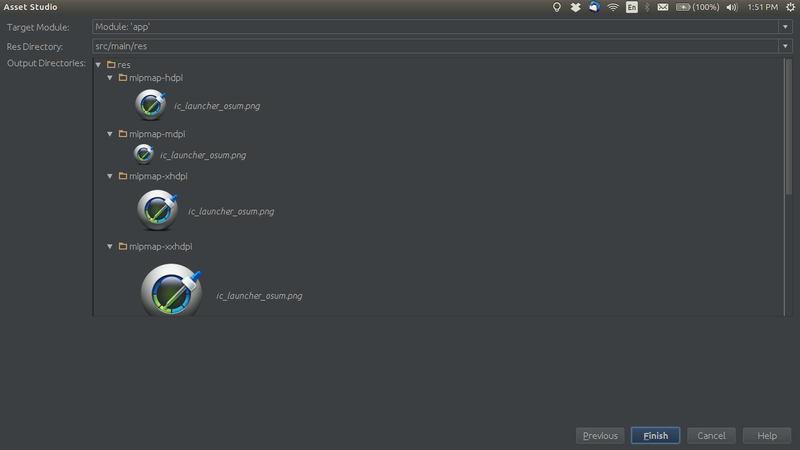 No need for third party tools when Android Studio can generate icons for us. Finally update android:icon name field in AndroidManifest.xml if required. 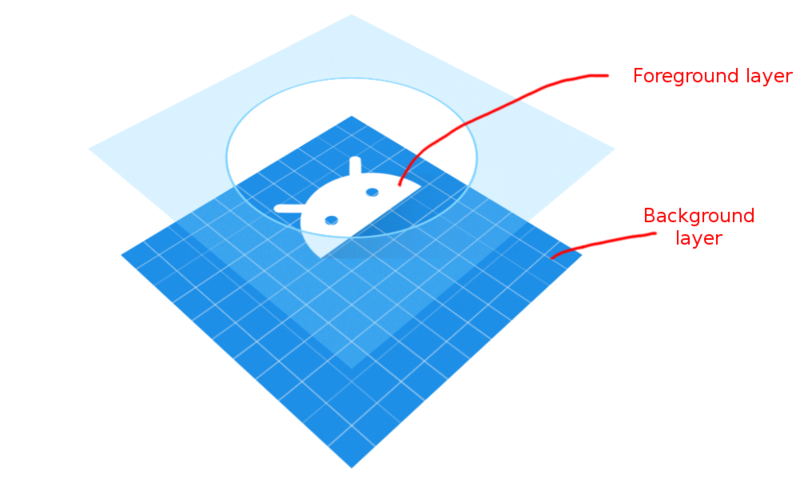 Starting with Android 8.0 there are adaptive icons, which are made up of two separate layers. Both layers are 108 x 108 dp. If you are supporting versions below Android 8.0, you still need to include the legacy sizes (48dp). I marked the pixel sizes in red for each resolution below. I suppose you could make all of those by hand if you want to, but I have to say that my days of doing that are over. 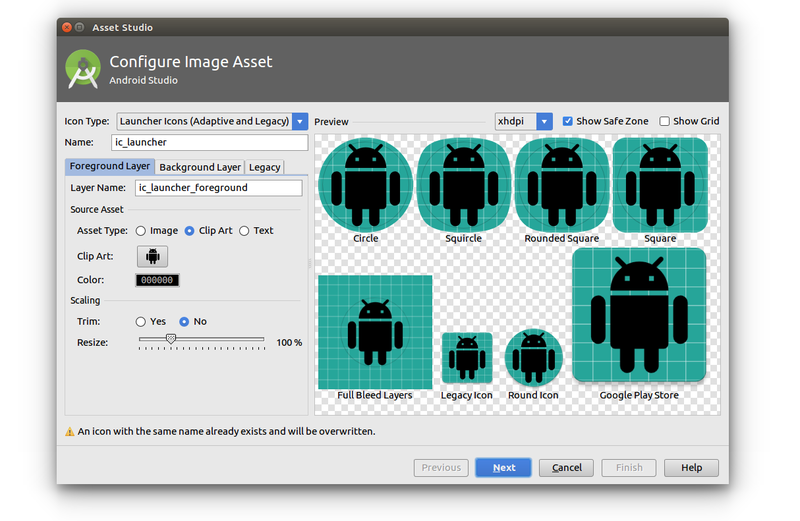 The Android Studio 3.0 Asset Studio is quite good and will generate them all for you. All you have to do is supply a sufficiently large foreground and background image. (I used a 1024 x 1024 px image). 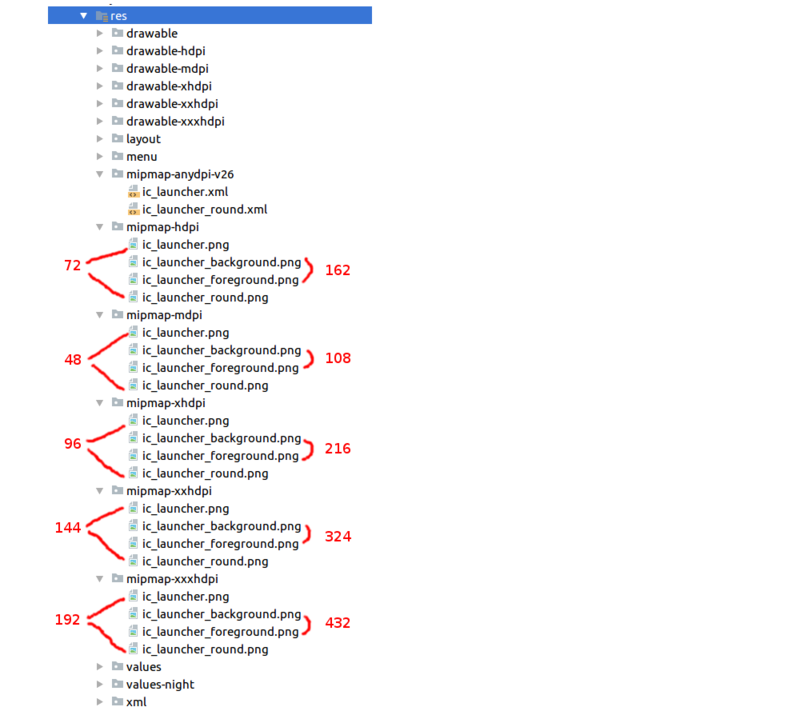 To open the Asset Studio go to File > New > Image Asset. It will generate all icons for you in the correct size, inclusive the web image for the play store. But Here are some tricks and way to get the better resolution for icons and launcher icons. 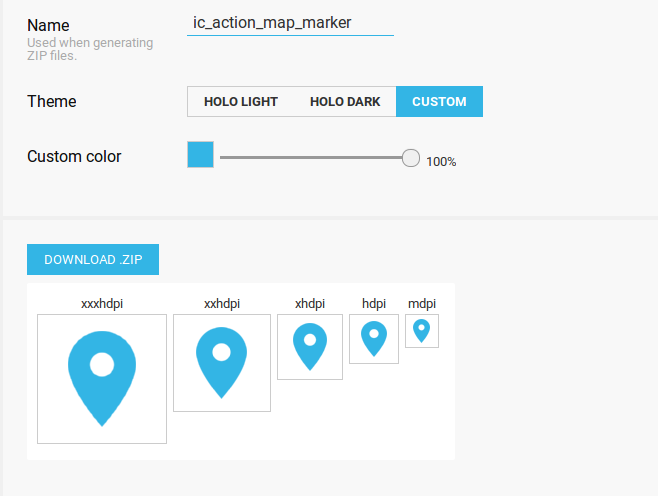 Then click the "Icon" to generate icon (.png) . Well the trick is try to generate as large icon as possible for high resolution devices and the tools will handle it all for small devices but if you use small icon , while generating the icon for high end devices you will loose the icon resolution . Click the "Custom" if you want to color your icon . No matter what color of icon you are uploading , by using Custom you can generate any color you want . Then choose a name and click "Download .ZIP" . This will download the .zip file with the icon for most of the common resolution . You can copy and paste the res folder in your application project folder and you will see the icon in the drawable section . According to the Material design guidelines (here, under "DP unit grid"), your product icon should be of size 48 dp, with a padding of 1dp, except for the case of XXXHDPI, where the padding should be 4dp. I recommend to avoid using VectorDrawable as some launchers don't support it, but I think WEBP should be ok as long as you have your minSdk support transparency for them (API 18 and above - Android 4.3). I've posted a script for generating all platform icons for PhoneGap apps from a single SVG icon file. If you have existing bitmaps, I also include some notes that may help you to generate the SVG vectors from an existing bitmap. This won't work for all bitmaps but may for yours. I had the same problem but then realized the arrangement of my icon graphic within the square allowed (512 x 512 in my case) was not maximized. So I rotated the image and was able to scale it up to fill the corners better. Then I right clicked on my res folder in my project in Android Studio, then choose New then Image Asset, it took me through a wizard where I got to select my image file to use. Then if you check the box that says "Trim surrounding blank space", it makes sure all edges, that are able, touch the sides of your square. These steps got it much bigger than the original. 2.CHange asset type to image. 4.You have options to trim,change padding and add background also.Change the values if you need. The image wil be automatically added to mipmap-mdpi,mipmap-hdpi,mipmap-xhdpi,mipmap-xxhdpi,mipmap-xxxhdpi if you select launcher icon or drawable-mdpi,drawable-hdpi,drawable-xhdpi,drawable-xxhdpi,drawable-xxxhdpi ifyou select other icon optins. Not the answer you're looking for? Browse other questions tagged android android-icons or ask your own question. How to change the application launcher icon on Flutter? 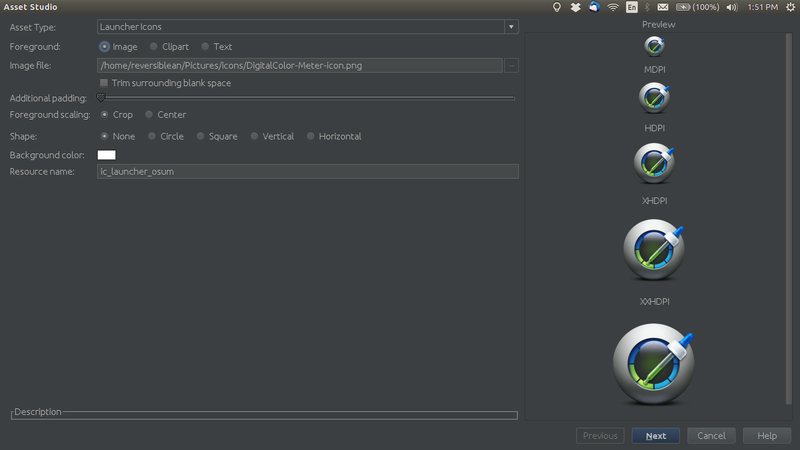 “Android Asset Studio” adds extra space when I upload my .png icons, but doesn't when it uses its internal cliparts. Why? 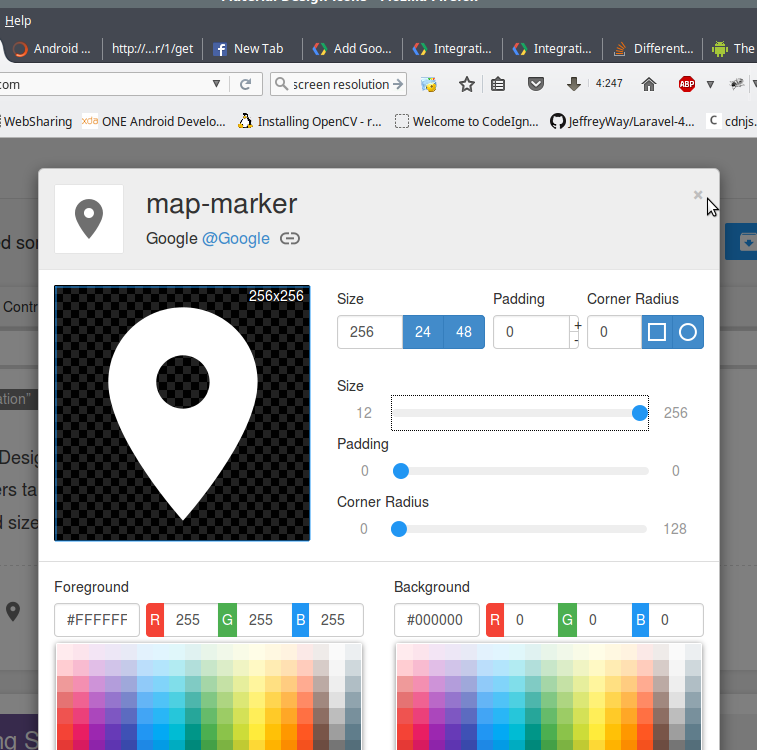 How can I get rid of transparent background space in (Android Asset Studio - Icon Generator)?